The Baylor University debaters shall henceforth be known as the Glenn R. Capp Debate Forum and the debate tournament at Baylor shall be known as the Glenn R. Capp Debates plaque presented February 2, 1978. It is doubtful that any university can claim a more consistently excellent forensic program than Baylor University, one that dates almost from Baylor's beginnings over 140 years ago. It all began as part of the weekly meetings of the Philomathesian Literary society in 1850, spilled over to intercollegiate competition when Baylor challenged the University of Texas to a debate in 1893 under the sponsorship of Baylor's Lone Star School of Oratory, took a shot in the arm in 1905 when the Baylor Oratorical Association assumed control, and really took off in 1923 when Baylor took over the activity as a university-sponsored program. Baylor University, chartered under the Republic of Texas on February 1, 1845, opened with twenty four students and one teacher in the preparatory department on May 18, 1846, enrolled its first collegiate students in June 1847, and reported its first collegiate students in June 1847, and reported enrollments of about one hundred students by January 1848. forensic activities were stressed almost from the beginning. Baylor's first annual catalogue, published in 1851, gives the first record of debates among Baylor students held at the regular weekly meeting of the Philomathesian Literary Society. By 1854, four rival societies had been organized. At first these societies scheduled debates and other speech contests for their weekly meetings. Later, competitions arose among the societies, and still later, championships were determined. These literary societies continued forensic activities, although with decreasing authority, until 1929. The first intercollegiate debate in Baylor's history was held in 1893 with the University of Texas. The best Philomathesian Society debater ( a young man who was later to become Governor of Texas and President of Baylor University) and the best Erisophian Society debater (who later served as United States Senator from Texas for thirty years) joined forces for this debate which created such intense interest among Baylor students that they chartered a special train to Austin, Texas, to support their team. The next year over 5000 people turned out for the return engagement held in the old Cotton Palace in Waco. The long history of forensics at Baylor as a university sponsored activity differs greatly in organization and administration from the period as a student-sponsored activity, but the primary purpose remains the same-to provide a worthwhile activity whereby students can band themselves together outside their regular classes to further their education. The competitive nature of the program motivates students to develop themselves intellectually and to sharpen their reasoning ability and communication skills. It also provides an opportunity for travel, for association with bright students from other universities, and for social enjoyment. Several years ago the Baylor University Office of Research and Testing made a two year study to correlate academic grade averages of students with various activities in which they participated. One year the forensic students had the highest grade-point average, and the other year they were second only to students in the honors program. Many ex-debaters can also be counted among Baylor's most distinguished alumni. For example, four of Baylor's presidents were Baylor debaters; namely, Samuel Palmer Brooks, Pat M. Neff, William R. White, and Abner V. McCall. At least three highly revered present or recent Baylor faculty members were debaters when I was director-Professors Matthew Dawson in the law school, Dr. Calvin Kent in the business school, and Dr. Robert Baird in the philosophy department. Former U.S. Senator Tom Connally and former Texas Governor Pat Neff represented Baylor in its first intercollegiate debate in 1893. In 1921, former U.S. Congressman W.R. Poage participated in Baylor's first debate tour. Later outstanding attorneys Phil Teeling and Frank Guittard represented the University and won first place in the first tournament in which Baylor participated in 1929. Price Daniel, former governor of Texas and United States Senator, won several honors in forensics for Baylor in the latter 1920's as did Thomas C. Mann, Ambassador to Mexico, William Boswell and Frank Wilson, Waco attorneys and Baylor law professors. Former Texas Governor Ann Richards also won many honors as a Baylor debater. Several additional ex-debaters have made significant contributions to education as college presidents. Others have had distinguished careers as teachers and administrators. More Baylor ex-debaters have gone into law than any other profession. That many of Baylor's more distinguished were debaters seems apparent. That participation in forensics contributed to their successes perhaps cannot be determined with certainty, but many of them think it did, as revealed by statements taken from published sources and letters in the department's files. Senator Tom Connally, in his book My Name is Tom Connally, discusses his experiences as a debater in the early 1890s and states, "The extracurricular activity which I found the most interesting of all was debating..."
Joe Allbritton, prominent attorney, head of numerous business enterprises, former owner and publisher of the Washington Star, and distinguished alumnus, stated in an article published in Speech Activities, " I can honestly say without any equivocation that the most valuable training I have received in preparing for a career in law was my forensic training....The value of intelligent presentation of ideas...cannot be over-estimated." 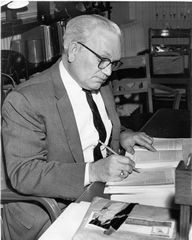 Abner V. McCall, Baylor's president emeritus and former chancellor, member of the Texas Supreme Court, and dean of the law school, said when dean, "Through personal participation in the debate work while at Baylor and through observation of debate students who have taken my law classes, I have come to believe that there is no college program more calculated to encourage a student to think for himself and to be able to do so under pressure...an ability of inestimable value...in any walk of life." These opinions are apparently shared by almost all of the more than 1000 debaters who have represented Baylor since its intercollegiate program began in 1893. "Excellence in Forensics--a tradition at Baylor University" is more than a slogan.